What next for the Voice Festival? Thanks for stopping by thevoicefestival.co.uk. In 2017 the Voice Festival (VF-UK) will celebrate 10 years. We’re preparing for this by taking stock – looking back to where we’ve come from, and what we have achieved, and considering what we should do next. We’ve created a short survey to understand more about how people experience the Voice Festival. We want to know your thoughts on what our focus should be for the future. So, we ask that you please spare 5 minutes to give us a little about your opinions and experiences of the Voice Festival. Please click here to take part in our survey. We thank you in advance for your insight. We are thrilled to share this message from Gareth Malone for supporters of the Voice Festival. Many familiar faces from the Voice Festival UK, past and present, will be flying the flag for British a cappella on the BBC’s new TV show, The Naked Choir, hosted by Gareth Malone. The show starts tonight, 9pm, on BBC2. Watch out for Choral Stimulation, who were awarded the Voice Festival’s Ward Swingle Award for Originality at this year’s University Championships, and the Sons of Pitches, who first took to the stage with the Voice Festival back in 2011. A number of our talented workshop leaders and competition judges have some very special roles in the show too. We’ll leave you to tune in and find out who. Watch closely and you will also see some clips from our recent Festival Weekend, and a cappella showcase at the Edinburgh Fringe. We hope you enjoy the singing! Dominic Peckham is regarded as one of the UK’s finest young, dynamic orchestral and choral conductors. Hailed as ‘one of the most exciting conductors of his generation’, Peckham has been commended at home and abroad for his ‘freshness and vitality’ directing both orchestras and choirs whilst delivering ‘gutsy, raw and exciting performances’. A conductor of immense energy and focus, Peckham is renowned for his dedication to the Renaissance and Baroque era, whilst also passionate about the delivery of new works and inspirational collaborations. In addition to his new appointment of The London Oriana Choir, Peckham holds an impressive array of posts including Artistic Director of The Royal Opera House’s ‘RM19’ Youth Chorus, Assistant Music Director of The National Youth Choirs of Great Britain, Artistic Director and Founder of iSingUK, Artistic Director of The Fourth Choir, Director of The Ulster Youth Training Choir and Guest Conductor for Aldeburgh Music. Recent engagements include a live broadcast with The National Youth Choirs of Great Britain Chamber Choir for BBC Radio 3’s ‘The Choir’ from Sage Gateshead, The 2013 Brighton Early Music Festival and a special broadcast for BBC World Service focusing vocal harmonies across the world. He has worked with orchestras including BBC Philharmonic Orchestra, City of Birmingham Symphony Orchestra, BBC Scottish Symphony Orchestra, British Federation of Youth Orchestras, Scottish Opera and has marked his debut at many prestigious venues across the UK including the Royal Albert Hall, the Barbican, Birmingham Symphony Hall, and Usher Hall. VF-UK Festival Weekend – Updates! We know you’re all dying to find out the results of today’s VF-UK shenanigans, so here’s a quick update! The five finalists to go forward to Sunday’s University Final are: the Songsmiths, the Techtonics, Semi-Toned, Out of the Blue and All the King’s Men! We’ve had a brilliant time here today at the Festival Weekend and would love to see some of you at our events tomorrow. Tickets are still available for the Sunday workshops, and of course for the University final, which features a very rare UK performance from the internationally renowned The Swingle Singers. Grab your tickets for a discount now online, or there will be limited availability on the door – come and support your favourite group, or just come and enjoy an evening of absolutely phenomenal a cappella talent! We’ve seen a taster today, and we know you won’t be disappointed! Did you see us on the One Show? There are many ways that you can get involved with a cappella through The Voice Festival. See below for the options that best suit you. Whatever you do, make sure you have fun, and share it with the Voice Festival Community online! Check out our YouTube channel to see performances from amazing a cappella groups from around the UK. Come and see some of the UK’s finest up-and-coming vocal talent at the Voice Festival UK Youth Competition at Wellington College, near Reading which is taking place on Saturday 27th April at 2.30pm. Tickets and more info here. The Voice Festival UK website and facebook pages list upcoming performances by UK a cappella groups – see “Your Events” on our homepage for details. Come and sing with us! On 27th April the Voice Festival will be running an introduction to a cappella singing in an hour, 1-2pm at Wellington College, near Reading. This session will be led by Dominic Peckham, as seen on ‘The One Show’! Whether you’re an experienced choral singer who wants to try something a bit different, or have only ever sung in the shower, come and join this fun, interactive session. Tickets and more details here. Of course, there are already lots of fantastic vocal groups out there who need new members. Could it be you? Have a look at the directories created by our friends at Sing A Cappella (for over 18s) and the National Youth Choirs of Great Britain (for under 18s) and see if you can find the group that’s right for you. Start a group! You don’t necessarily need to be able to read or write music to start a group. Start from scratch with a few friends, a bit of vocal talent and a lot of enthusiasm! We can even send a Voice Festival UK vocal practitioner to help get you started. E-mail us at voice@thevoicefestival.co.uk for support in getting a group off the ground. ALREADY IN AN A CAPPELLA GROUP? 1. How did you get involved with the Voice Festival UK? I got involved with The Voice Festival when I entered the University Competition with Voice Versa in 2012. 2. What is your role within the team? I am undertaking the newly created position of Festival Administrator which means I get to dip into all aspects of the Voice Festival. 3. What has been you favourite Voice Festival moment so far? Favourite moment is probably the first time I got involved into the a cappella scene in my second year at university. I was amazed at how great music can sound by using voices only! 4. Who is your favourite professional group? 5. Have you got any secret talent/fact to share with everyone? 7. What do you do outside of the a cappella world? The Voice Festival UK is very excited to update you with news of our growing team. Now entering our 6th year, we’re working hard to put in place a model that will enable us to support and grow the UK’s exciting a cappella scene for years to come. As well as some changes amongst the roles and responsibilities of our current volunteers, we are welcoming 5 new volunteers to the team – each brimming with great ideas, energy and enthusiasm. We hope this will go a long way to developing our programmes and enabling us to support emerging and experienced a cappella singers from across the UK. Please see our ‘Who’s who‘ page to find out a little more about each team member and why they’ve got involved. We’re currently taking stock of our programmes and exploring where we will focus our energies this year and beyond. We will be sharing more information with you in the coming weeks, so please keep your eyes peeled to our website. 1. How did you get involved with the Voice Festival? Back in 2010, during my second year at university, I became the President of the Oxford Belles. I left the group 18 months later, but never lost my love for everything a cappella, and kept popping up at Voice Festival University Programme regional rounds and finals to hand out programmes, help out front of house, or sell CDs… anything to stay involved! Of course, when a friend on the team told me about the exciting new roles advertised in 2013, I couldn’t wait to apply. I’m the Communications Manager – I work with our Communications Director, Cherith, to suss out the best channels to communicate to all of you what’s new in the exciting, ever changing and rapidly growing community that is the UK a cappella scene! 3. What has been your favourite Voice Festival moment so far? 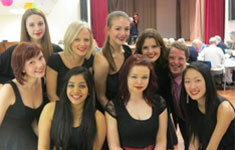 Back when I was in the Belles, I attended a superb Voice Festival workshop led by VF-UK patron Joanna Forbes L’Estrange. It was a long time ago now, but stuck with me ever since. Participants were mixed up into new groups, and each group had a short time to come up with a fresh arrangement of the traditional ballad Scarborough Fair. For me, that’s what the Voice Festival is all about: it’s a forum for collaborating with new people and learning to adopt fearlessness when experimenting with new ideas. I know we’ve heard it all before, but I can’t get enough of Pentatonix. They’re quirky and never fail to bring a smile to my face. I’m lucky enough to be doing a PhD in Anglo-Saxon Literature – finally putting those medieval skills to good use!